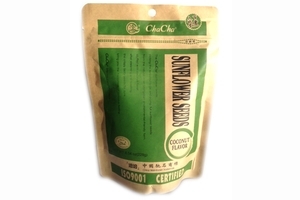 Cha Cha Sunflower Seeds, Roasted & Salted with Coconut Flavor in 8.04oz (228g) Pack. The Chacha sunflower seeds, picking the selected large and plump full sunflower seeds from the natural inner Mongolian environmental-friendly stuffed with traditional herbal flavor, after steaming and roasting, the crispy tasty seeds for sure bring you the happiness of delicious feeling. The Cha Cha Snacks, Delightful Taste! Product of China. All Natural ₪ | No Preservative ≠ | No Coloring ۾∞ | Vegetarian Certified ◘ | Halal Certified حلال . | ISO 9001 Certified. Very good, large seeds, not salty with a hint of coconut. Good bulk price with free shipping a plus. These are great! I ordered these for my daughter to try out. We eat a lot of Sunflower seeds and thought, Coconut? That's weird. I like them more than she does! If you like sunflower seeds, you really have to try this. I'm putting them on my quick order list.